W. Blake Gray profiles Almaviva the collaboration between Baron Philippe de Rothschild and Chile’s Concha y Toro. Nova Cadamatre, a newly minted Master of Wine, describes her feelings as she learned of her accomplishment. Allison Levine tells the stories of ten Garagiste producers (under 1000 cases annually). 1 WineDude weighs in on the bogus scientific credentials of wine scores. 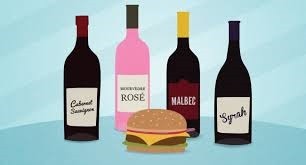 Bob on Sonoma has some good advice for pairing wine with burgers. The Drunken Cyclist shares the story of his return to an old favorite, Gosset in Champagne. Hawk Wakawaka reports on her trip to Galicia, Spain. Aaron Nix Gomez discovers three value wines from Gigondas. John Fodera files the last of his comprehensive reports on the 2012 Brunellos. Quentin Sadler reviews a happy, happy Syrah the Maison Les Alexandrins 2006 Vin de France. The Wine Curmudgeon’s wine of the week is the Rocca di Montemassi Le Focaie 2016, a Tuscan Sangiovese. Jeff Leve, the Wine Cellar Insider’s Wine of the Week is the 1996 Grand Puy Lacoste, from Pauillac.